Greenwood Community Church v. City of Greenwood Village. The Becket Fund for Religious Liberty (n.d.). Retrieved from https://www.becketlaw.org/case/greenwood-community-church-v-city-greenwood-village/. Greenwood Community Church v. City of Greenwood Village. (Apr. 04, 2019). https://www.becketlaw.org/case/greenwood-community-church-v-city-greenwood-village/. "Greenwood Community Church v. City of Greenwood Village." The Becket Fund for Religious Liberty. Accessed [Apr. 04, 2019]. https://www.becketlaw.org/case/greenwood-community-church-v-city-greenwood-village/. The church has grown considerably in recent years, and the present building is no longer larger enough to accommodate all of its activities – worship services, youth group meetings, adult bible studies and other religious meetings and events – and so in the spring of 2000, it applied for an amendment of its Special Use Permit to expand both the building and associated parking spaces. A member of the congregation had donated an additional four and a half acres of land immediately adjacent to the original 9 acre property in 1997, and the application proposed using the additional vacant property for the expansion. The expanded facility would occupy up to 61,485 square feet, roughly doubling available floor space and including an expanded sanctuary (at 900 seats, still 75 seats fewer than authorized under the original CUP), chapel, music room, classrooms and community area. The church was meticulous about meeting city requirements for the proposal. A required (and noticed) neighborhood input meeting was held on July 26, 2000. Other than church and city representatives, only one area resident attended, and testified that the church does not cause traffic problems on Sunday mornings. The church spent some $250,000 on engineering, planning and architectural fees and expenses, and to prepare its application plans and respond to city requests. On November 6, 2001, the city Planning and Zoning Commission held a public hearing on the application, and in response to newly raised concerns expressed at the meeting, the church agreed to drop its proposed day care use of the property. A month later, the Commission voted 5 to 1 to recommend that the City Council approve the application. In January, 2002, the city’s planning staff sent a memo to the Council stating that the application met all applicable standards, codes and criteria, and recommended approval. The City Council held a public hearing on the application on January 28, and then took no action on it. Forty-nine days later, on March 18, 2002, the Council abruptly adopted “Findings of Fact, Conclusions and Order,” denying the application unconditionally, without proposing any changes or conditions for approval. Among the Council’s “findings” was that the Religious Land Use and Institutionalized Persons Act (RLUIPA) was unconstitutional, and that it would therefore ignore the law’s requirements. 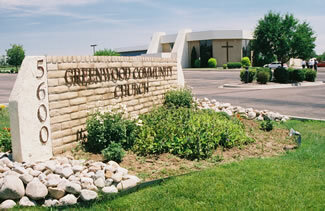 On May 6, 2002, Greenwood Community Church filed suit against the City of Greenwood Village in Arapahoe County District Court, charging that the City’s actions were “arbitrary, capricious, unreasonable and an abuse of discretion.” It alleges violations of the U.S. and Colorado Constitutions and RLUIPA, and asks the court to issue a preliminary and permanent injunction against the city, as well as an order directing the city to “issue all permits and authorizations necessary” for the expansion project. On June 7, 2002, Becket joined the lawsuit on behalf of Greenwood Community Church. In September 2002, the church and the city agreed to explore resolution of the case. After several months of talks, The Greenwood City Council met to reconsider the application at its meeting on December 2, 2002. On a vote of 6-2, the Council reversed its earlier decision and approved the church’s expansion plans. In addition to compromises agreed to earlier, the church will accept a reconfiguration of its expanded parking area, more than doubling the setback from its eastern boundary, as well as a further reduction in square footage of the new, larger building.